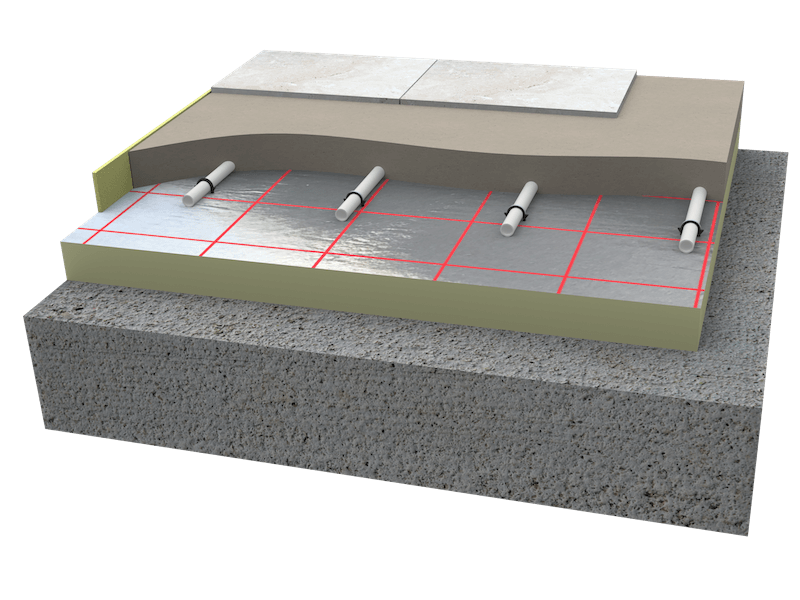 Before choosing underfloor heating, many factors need to be considered; one of, if not the most important of which, is floor construction. 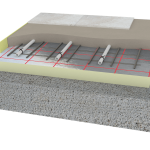 Underfloor heating can be fitted in both concrete and timber suspended floors, but for other floor constructions (for example we also offer a ‘floating floor’ solution) please contact us. 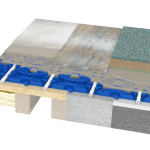 Also, note that we can offer many different floor constructions for concrete and timber suspended floors, if you have special requirements please get in touch. 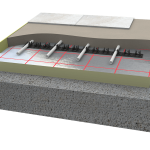 In concrete screeded floors, the screed acts to diffuse the heat across the surface, providing an even temperature at floor level. 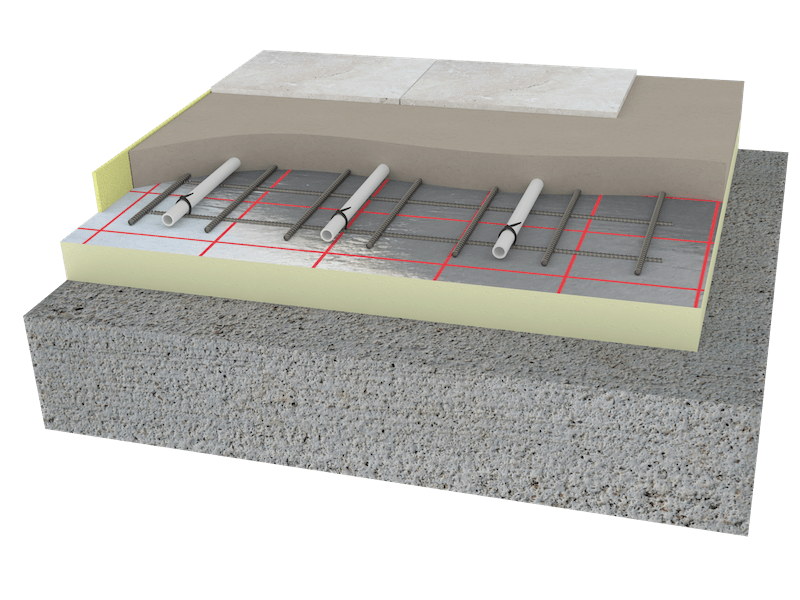 Depending on the type of building, construction or standards, there are a number of methods for laying underfloor heating pipes in concrete floor structures. 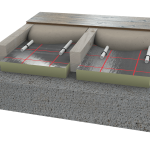 A concrete slab (or suspended beam and block construction) is laid over a damp proof membrane. A 20mm thick piece of insulation is fixed to the perimeter (external) walls, to a height to include the depth of floor insulation and screed. Whilst the edging insulation may be on show, it is covered by wall plastering and skirting boards. 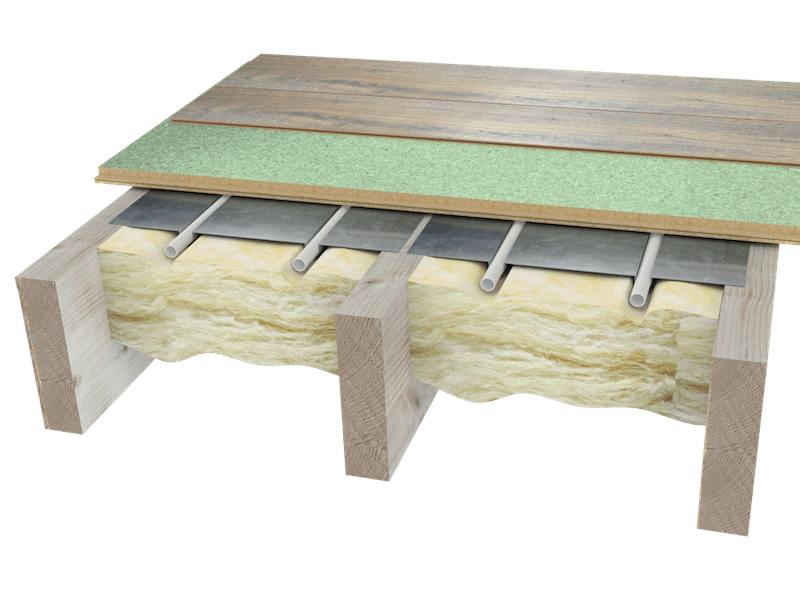 Floor insulation is laid over the whole area and joints are taped to prevent the ingress of screed between the insulation boards. The floor is now ready for the underfloor heating pipework installation. 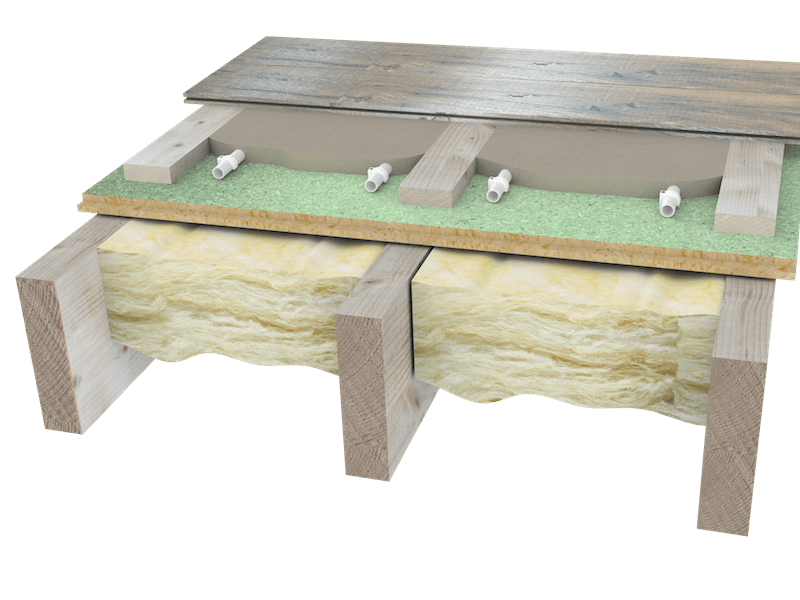 We recommend you use a minimum layer of 50mm Polyurethane insulation. 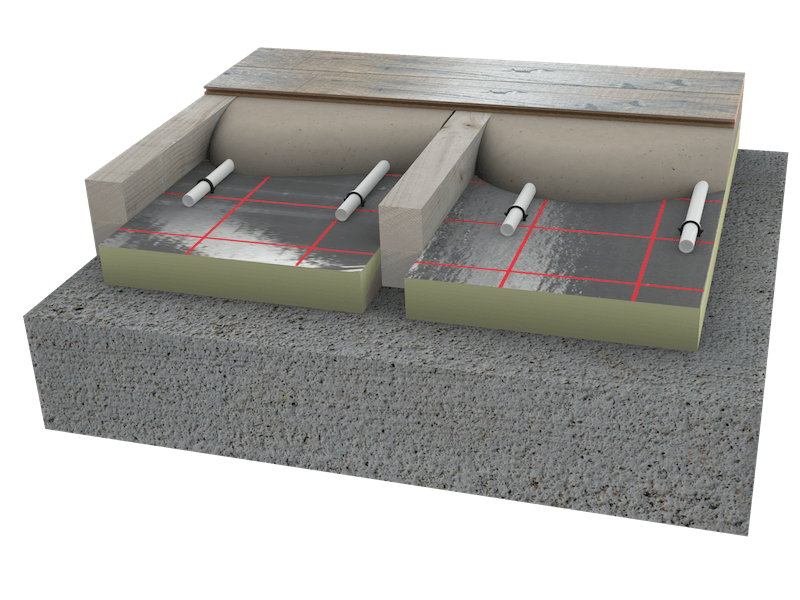 If there is not enough space for 50mm insulation, 30mm can be used. 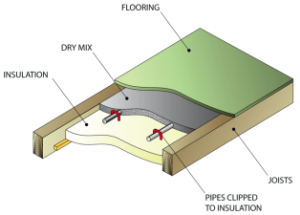 We recommend Polyurethane as it outperforms Polystyrene and its greater density allows use of clip fittings. 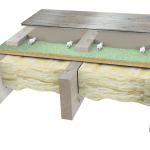 All insulation requirements need to comply with the current building regulations. 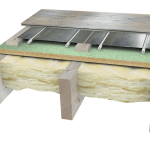 View our FAQs for more insulation information. 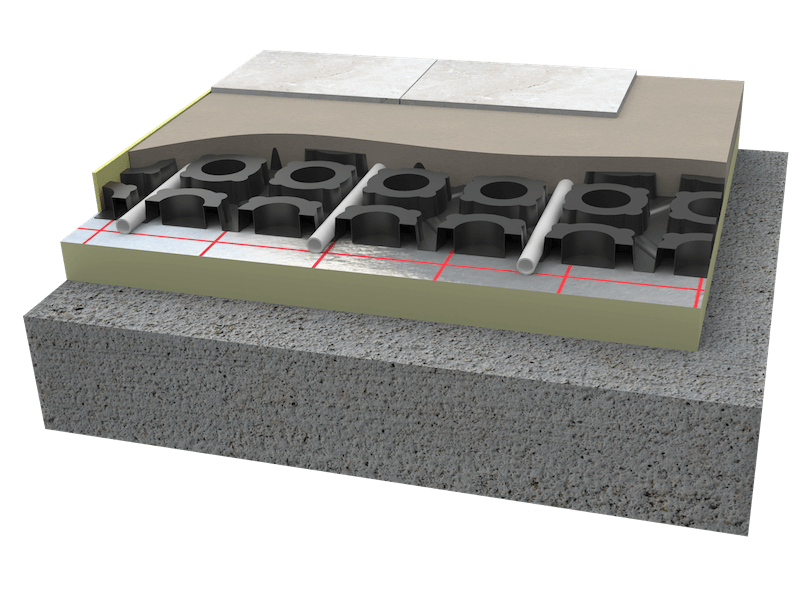 Finally 65 – 75 mm screed is laid on top of the insulation and piping. 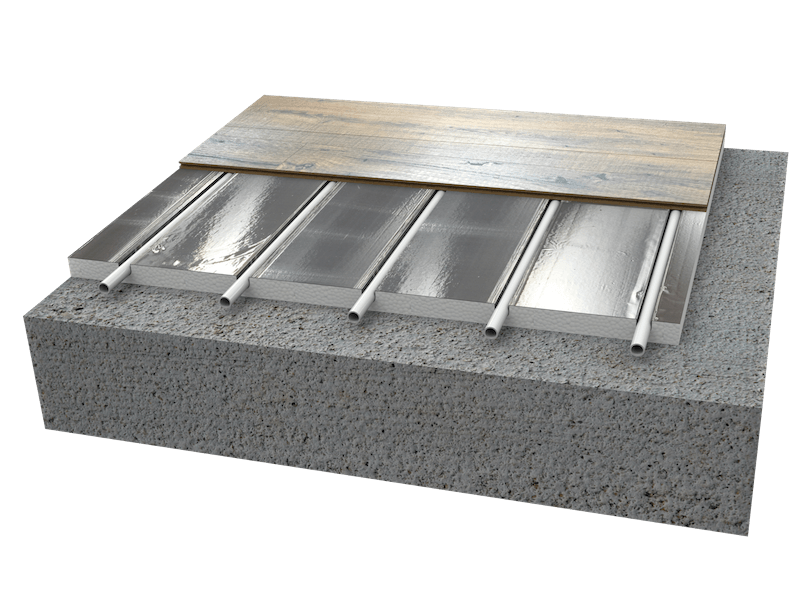 If using polystyrene insulation (50mm) it is recommended that you install wire mesh on top of the insulation and tie the pipe to the mesh. For other floor constructions please contact our technical department. 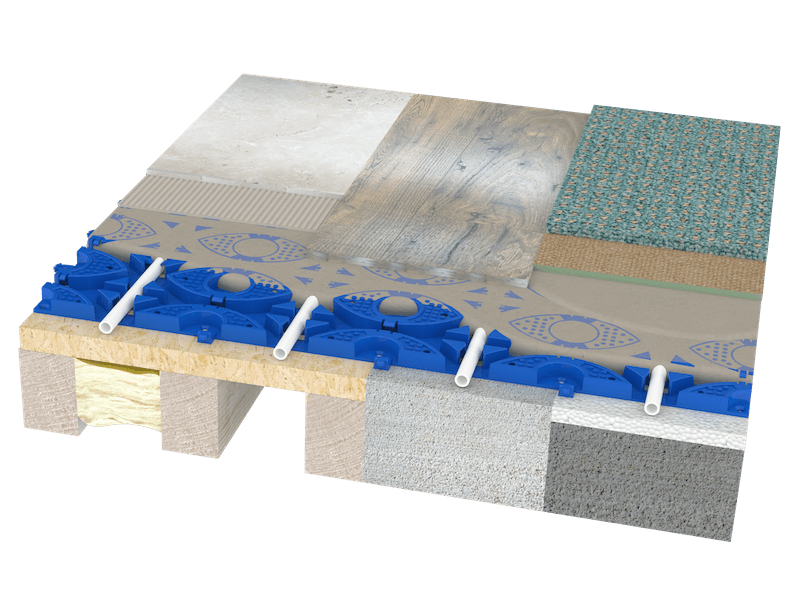 50 mm liquid screed or fibre screed can also be used for screeded floors. With liquid screed it is important to install a plastic membrane on top of the insulation and to use the edging strip around the perimeter of the walls. 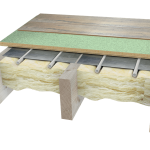 Timber suspended floors do not conduct heat as efficiently as screeded floors. This means that the heat output is less. Some manufacturers use heat emission plates to try to achieve an even floor temperature. This is a very expensive way of installing underfloor heating in timber suspended floors and at the end of the aluminium plate the temperature is not going to be very high. Clearly there should be a cheaper solution that works without using the very expensive aluminium plates. 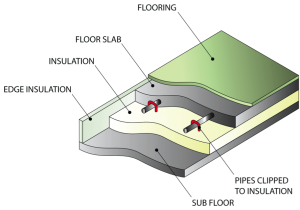 After all, first floors are often timber suspended and less heat is usually required as it is supplemented by heat from the ground floor. 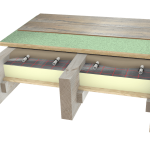 Our system is very simple and easy to install in timber suspended floors. The system is based on hundreds of installations that are now working with total satisfaction. Between the joists, a 50mm polyurethane insulation board is cut for a tight fit. 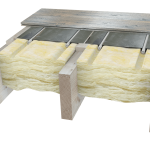 It is advisable to use scrap battens from the building site to support the insulation from below. The pipe is then clipped to the insulation with our special pipe clips. The floor boards are then laid on top of the joists. 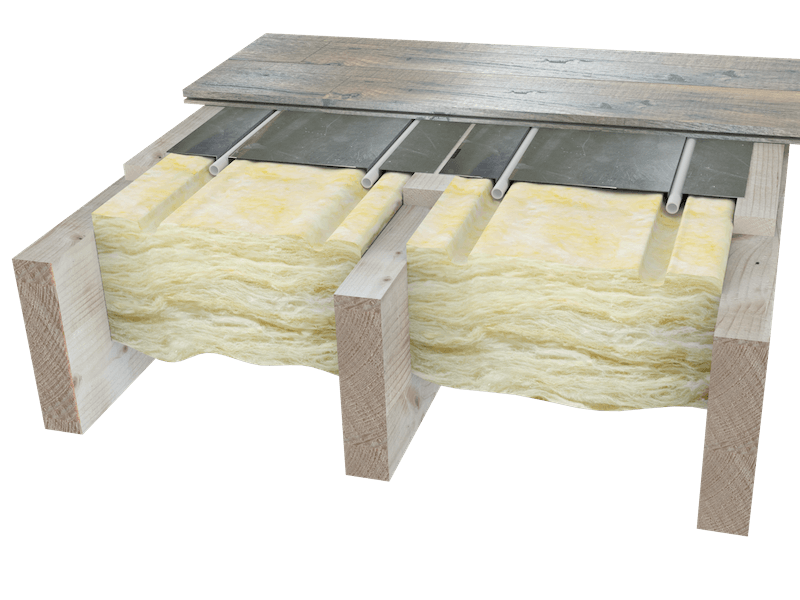 Be careful not to leave too much air space between the insulation boards and floor boards (25mm is recommended). The joists need to be notched where needed for pipe runs. 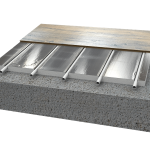 To get the timber suspended floor to act as a screeded floor and to give out more heat, the air gap between the insulation and the floor boards should be filled with a lightweight screed mix. 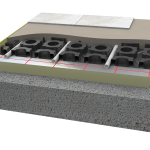 The infill is normally 10:1 sand/cement mix at a height of 25 mm.